After looking at other artists use of ‘found’ paper, I decided to try some faded green A4 paper from an old scrap book. I chose the fruits for their texture and colour . Also, because I wanted to try my coloured pens for the finer detail and oil pastels for their texture and to help build up tone. The first difficulty with the support was that their wasn’t enough tooth to easily hold the oil pastel , although I did like the way the green paper then peeked through. The oil and pen did not mix well, the pen scraping off the wax if applied on top. However, I quite like the overall affect as the mixture of textures and colours are interesting and the mediums have forced me to work in a less precise manner leading me to be more spontaneous and experimental. 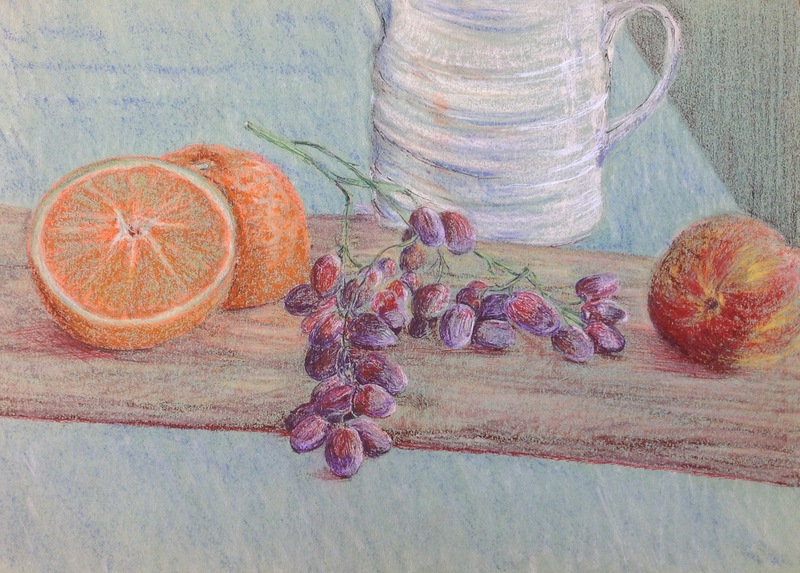 Previous Article Project 2- Exercise 2 : Still life in tone using colour.